RII Sergeant Wayne Davis has been a volunteer with the Reserve II Unit for over 30 years. 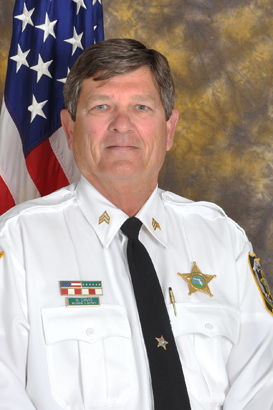 He began his volunteer career as a Reserve II Deputy. Since that time, he has risen through the ranks to his current position of Reserve II Sergeant. Throughout the years, RII Sergeant Davis has taken on many additional responsibilities, which include being the squad coordinator for special events. He is also assisting the Homeland Security Division with the coordination of filling non-paid details with the Reserve I Unit. He has volunteered to work many non-paid details at the request of the Homeland Security Division and the Sheriff’s Office. RII Sergeant Davis not only volunteers his time personally on uniform details, but he coordinates dozens of volunteer jobs each month. He communicates promptly and routinely with the Reserve Units and with the Homeland Security Division’s chain of command. RII Sergeant Wayne Davis’ dedication is such that he never misses RII Staff or General Meetings. Recently, when he and his wife took a vacation to the East Coast they drove separate vehicles. He did this so that he could leave to attend one of the meetings and then return to their vacation. RII Sergeant Wayne Davis’ commitment to filling vacant positions has enhanced his knowledge of every type of non-paid detail at the Sheriff’s Office. He repeatedly takes it upon himself to fill open positions that are last minute requests or when manpower is short. In 2014 alone, RII Sergeant Davis volunteered nearly 1100 hours to the Sheriff’s Office as a member of the RII Unit.